This page will discuss both the causes and treatments of the recession that is seen usually in mouths that don't have gum disease (periodontitis). There are some cases where gum infection occurs after recession has occurred, but that is where the gum disease is the result of the problem, not the cause of it. 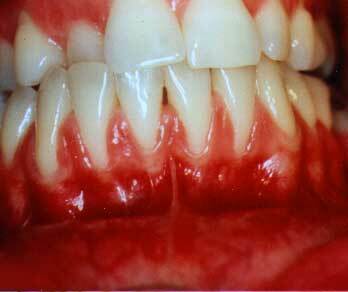 Patients may usually be aware that there are no signs of periodontitis (bleeding gums, redness, looseness of teeth) and then they wonder why they have this recession. Contrary to what some people have been told, most recession is not caused by patient neglect. 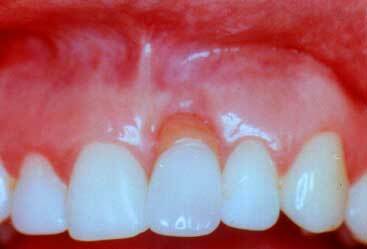 It is usually the result of the lack of thick, tough tissue which borders where the gums meet the teeth. 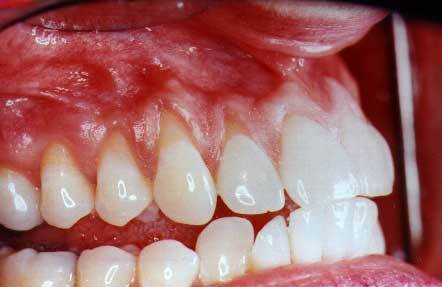 This thick, tough tissue is called Attached Gingiva. 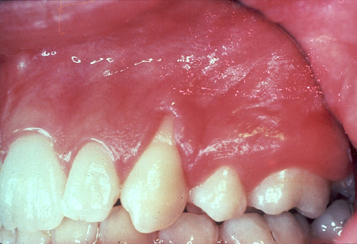 There are cases when patients cause their recession by brushing too hard, but in most cases, the patient should not feel guilty regarding the cause of their problem. Recession is usually something to which the patient has been pre-disposed. 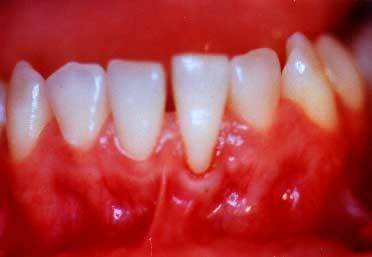 These lower teeth have advanced recession.The teeth themselves are almost "pushed" through the bone and gum. The lack of thick gum tissue is due to these roots being so prominent. When a tooth erupts into the mouth, it should be surrounded by a layer of bone. If the bone is of a normal thickness, then it causes the developing gum tissue (which will cover the bone) to develop as a thick, tough layer of tissue. Nature designed this tissue to be tough in order to withstand the forces of chewing food hitting the gums. If the developing bone is thin or absent on one side of the tooth (usually the lip or cheek side) the gum tissue that develops will be thin and fragile and not be able to withstand the normal forces that are applied to it from chewing and proper brushing. There is a muscle attachment at the base of this recession. This muscle attachment creates tension on the gum tissue and can cause recession to occur -- usually occuring on teeth which have prominent roots. The mouth is a series of muscles which give you not only the ability to chew, but also to move your lips in ways such as "puckering up" your lips for a kiss. Some of these muscles originate under the lips and skin and have muscle attachments which insert into the gums -- usually not right where the gums meet the teeth. If the attachments are right on the margin of where the gums meet the teeth, or if the attachments are very large, and especially if the roots of the teeth are prominent, there is the potential for recession. 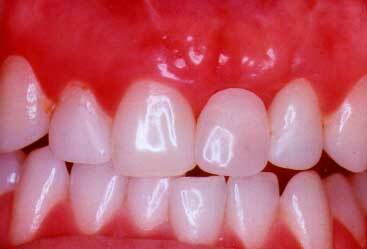 This recession is diagnosed during the course of her orthodontic treatment. 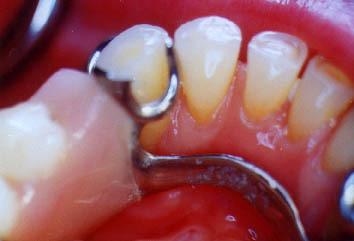 The cause of the problem is the prominent roots due to the lack of heavy bone. The patient's jaw bone limits the orthodontist as to where he can move the teeth. The orthodontist's work is perfect! 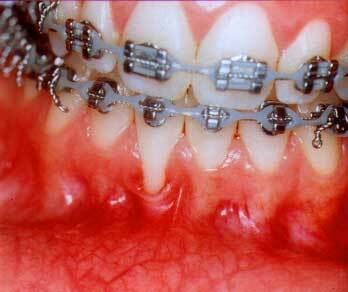 c. Associated with Orthodontic Treatment. Patients undergoing orthodontic treatment may have recession treated before they begin their orthodontic treatment, during their orthodontic treatment or after they have completed their orthodontic treatment. The primary problem with recession that is associated with orthodontic treatment is that many times the patients do not have heavy, thick layers of bone over the roots of the teeth which are to be moved. If the teeth are very crowded before orthodontic treatment, the only way to put the teeth into a good alignment may be if the roots of the teeth are made more prominent. The finest of orthodontic treatment can not overcome the lack of enough space in the jaw where the teeth could be moved without making the roots of the teeth more prominent. This is especially true when you consider how many parents do not wish for the orthodontist to extract teeth as part of the orthodontic treatment plan! There are also circumstances where recession will still occur even after some extractions were done. 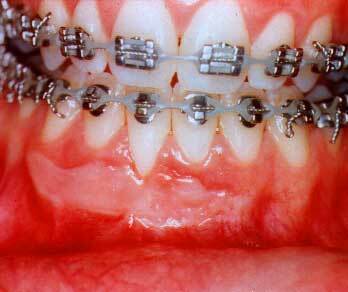 Perfect orthodontic treatment can not overcome what nature did not adequately provide!! 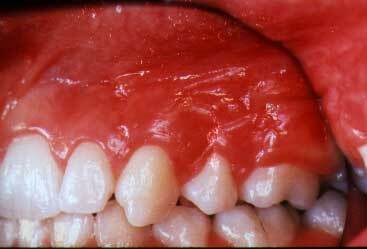 The excessive wear of these teeth is related to her excessive and vigorous brushing with a brush that was "stiff", not "soft". This is where the patient either brushes too hard, too often or with too hard of a brush (only a "soft" bristled brush should be used). 2. 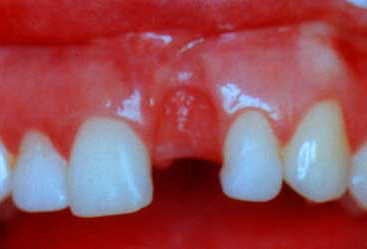 Trauma from a Removable Partial Denture. 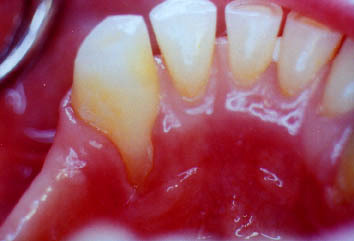 Patients who wear a removable partial denture risk recession to the gums usually on the tongue side of the lower teeth. If the partial denture fits against the gums too snugly, it will irritate the gums or "strip" the gums away from the teeth. A removable partial denture that has been worn for years or a new denture that "hurts" on the gums or "creates pressure" may increase the chances of getting recession. The Free Gingival Graft is a procedure where a thin piece of gum tissue is removed from the roof of the patient's mouth and transplanted to another site in order to create thick tough tissue or "attached gingiva". 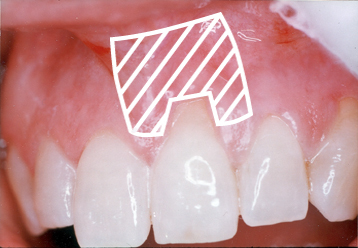 The lateral graft is also called a "pedicle" graft since the gum tissue is raised from the area immediately lateral, or adjacent, to the area of recession. 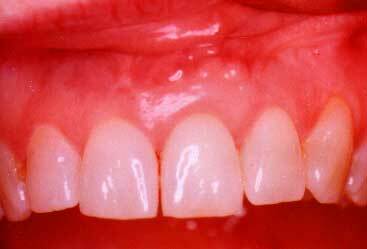 In order to do this, there must be an abundant amount of thick, tough, "attached gingiva" lateral to this area of recession. This is frequently not the situation in many cases of recession. 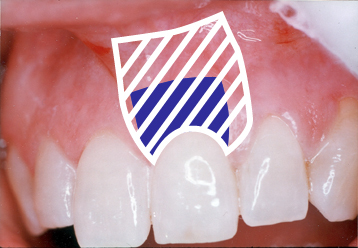 This "pedicle" of gum tissue is then rotated over the area of recession in order to attempt to cover the recession, as well as create a thick band of "attached gingiva" which will prevent further recession. A limitation of this procedure is that there can be some recession occuring from where the "pedicle" was moved from. The artist's drawing shows from where the "pedicle" flap will originate. When there is not enough thick tissue next to an area of recession and a lateral graft can't be done, the "Sub-Epi" graft can be done. This usually uses a piece of gum tissue taken from the roof of the mouth but from under the superficial, surface gum tissue. An option, in some cases, is to use a "man-made" membrane instead of taking any tissue from the roof of the mouth. In the surgical procedure, the gum tissue or "man-made" membrane is placed over the root of the tooth. 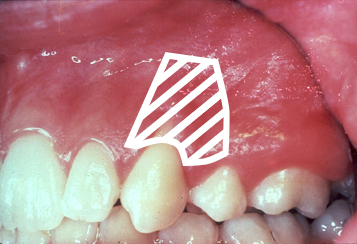 A flap of gum tissue is raised from the base of the recession in order to cover the gum tissue or membrane -- in order to provide a blood supply to the graft. This creates the potential to create healthy, tough tissue and also create a better cosmetic result. The "drawing" shows where a flap of tissue will be raised to cover the graft. When some of the upper front teeth are removed (usually if a tooth fractured or a root canal failed), there may be the excessive loss of bone from where the tooth came out. This can leave an unsightly, or even ugly "depression" in the gum tissue. 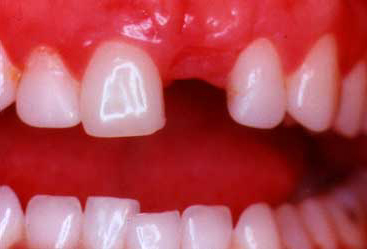 Too often, when a "dummy" tooth is replaced into the mouth, this "depression" requires the "dummy" or replacement tooth to be too long and unsightly. 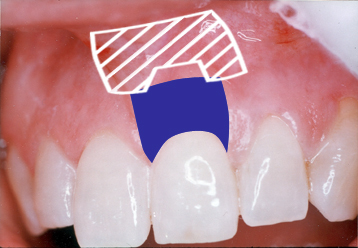 Before the replacement tooth is to be made, the "Sub-epi" graft should be done in order to reconstruct this deformed area. 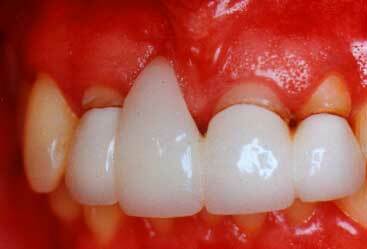 The result will be a more natural looking tooth and a happier smile. This is a bridge with a very poor appearance. 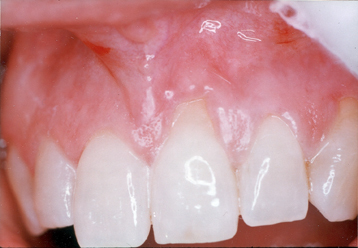 This long replacement tooth could have been avoided with a "Sub-epi" graft. With the tooth taken out, you can see how the plastic extension has "dug" into the gum tissue. 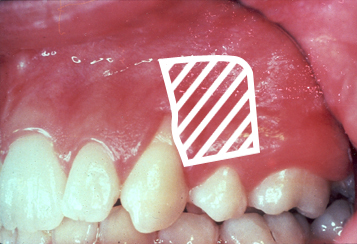 A "Sub-Epi" graft will be placed under this depression in order to "plump-out" the gums.